Have you noticed the newest be. shirts around the office? They’re the ones with the symbols on the back. Those symbols are actually chakras, and they represent the holistic approach to medicine that be. has become known for: care for the grounded body, the joyous heart, the enlightened mind, and every part in between. 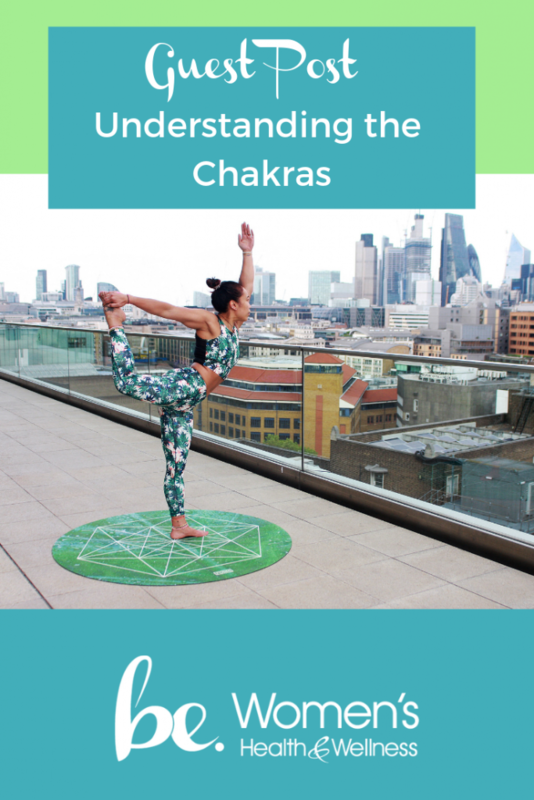 “Chakra” means “wheel of spinning energy” in Hindi. Some believe that you can recharge these spinning energy discs through meditation, prayer, and even the foods you consume. Traditionally, Ayurvedic (“whole body”) healers would treat the chakras as well as the body when a person became ill. While you should never diagnose yourself with any condition – or just assume that a spiritual imbalance is to blame for a medical condition – understanding these parts of the body can help you support each as you maintain a healthy lifestyle. For those who don’t believe in chakras, I still recommend learning a little bit about them. Many people find it helpful to separate the body in segments during mindfulness practice, like yoga or meditation, and this system makes sense for doing that. Starting from the bottom of the system, the Root Chakra represents your foundation, your base. Located at the base of the spine, the Root Chakra corresponds to your feelings toward your physical security: financial stability, feeling supported by your friends and family, and feeling grounded. If you feel a bit too flighty, try focusing on this part of your body and imagine a grounding cord extending from your waist to the earth, bringing you stability and safety. Breathe deeply and recite affirmations like “I am safe,” and “I am grounded” to balance this part – and the rest – of your body. In ancient medicine, it was believed that menstrual and other reproductive issues were caused in part by an imbalance in the Sacral Chakra. It’s here that our creative energy lives. When it’s balanced, you feel abundant, creative, and free. You also feel good about your sexuality, and take joy in the pleasure of all the senses. You’ve got the power! Your Solar Plexus corresponds with your sense of personal power, your self-confidence, and your self-worth. When you feel in control of your life, this chakra is said to be balanced. The Heart Chakra serves as the bridge between the chakras of the body and the chakras of the mind and spirit. As the name and location suggest, it is the place that corresponds with love, joy, and inner peace. If you’ve been diagnosed with bronchitis, try meditating on your Heart Chakra every time you take your medication. Imagine the medication fighting the illness and fill your mind with thoughts of love for your heart, lungs, and body. This chakra is all about communication. When you freely speak your truth, you’re giving your Throat Chakra a little love. Traditionally, health problems like strep throat, thyroid conditions, and laryngitis were attributed to an imbalance in the Throat Chakra. Although we know differently these days, giving your throat a little intentional love when its sore and you’re on medications can’t hurt. The Third Eye Chakra corresponds to your intuition, wisdom, and your ability to make decisions. When you find yourself questioning spiritual things or meditating on an issue, it’s said that your Third Eye is engaged. If you regularly meditate, then you know that this is one of the best points at which to direct your attention on your body. Your Crown Chakra is believed to connect you with the divine. It’s also connected to your central nervous system and your brain. When it’s balanced, it’s said to assist you in blissful understanding and is meant to be your connection with the divine. None of the chakras can stand alone, and each is reliant on the one under it. In this way, the chakra system is a perfect representation of what healthcare should be – treating the whole person: body, mind, and spirit. It’s one of the reasons I love be. Women’s Health & Wellness so much.